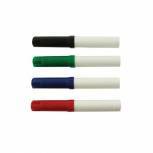 Q-Connect Flipchart Marker Pen Bullet Tip Assorted (Pack of 4) KF01551 Pack of 1 Q-Connect Flipchart Markers, specially designed for use on flipcharts. Bullet tipped with a good resistance to bleed-through. Perfect for presentations or making posters. Assorted Colours. Wallet 4. 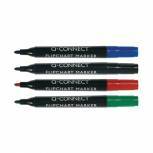 Assorted Flipchart Markers (Pack of 4) WX01551 Pack of 1 Pack of flipchart markers. Bullet tip for medium line width. Ideal for flipcharts and dry-erase boards. Chunky coloured cap. Smooth barrel for comfortable grip. Assorted wallet: blue, green, red and black. Pack of 4 pens. 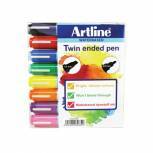 Artline 2-in-1 Flipchart Marker Assorted (Pack of 8) EK-325T-W8 Pack of 1 Artline Water Colour Markers 325T. Water based bleedproof ink provides intense colour. Ideal for flipchart use. Also perfect for block colouring. Wallet of 8 assorted colours. 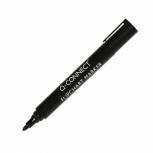 Q-Connect Flipchart Marker Pen Bullet Tip Black (Pack of 10) KF15392 Pack of 10 Q-Connect Flipchart Markers, specially designed for use on flipcharts. Bullet tipped with a good resistance to bleed-through. Perfect for presentations or making posters. Colour: Black.